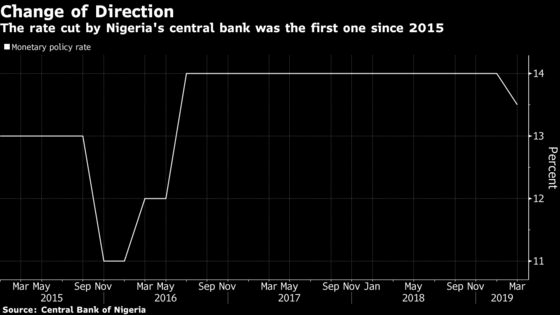 (Bloomberg) -- Nigeria’s central bank unexpectedly reduced its key interest rate for the first time in more than three years to help boost the economy. The Monetary Policy Committee voted to cut the rate to 13.5 percent from 14 percent, Governor Godwin Emefiele told reporters Tuesday in the capital, Abuja. The median estimate in a Bloomberg survey was for the key rate to be held at 14 percent. Departing from his usual hard stance on inflation, Emefiele stressed the need for monetary policy to help boost economic growth and job creation. The West African economy is still recovering from five quarters of contraction in 2016 and 2017 and will probably expand only 2 percent this year, according to the International Monetary Fund. Six of the 11 MPC members voted for the 50 basis-point cut, two wanted a 25 basis-point reduction, one favored a 100 basis-point cut and two said the rate should stay unchanged. The move is a shift from eight months ago, when three of the panel members favored rate increases. The cut could bring some pressure to bear on the naira, according to Michael Famoroti, an economist and partner at Stears Business, a Lagos-based research and analytics firm. The bank held the base rate at a record 14 percent since July 2016 to fight inflation, which remains above the upper end of the authorities’ target range of 6 percent to 9 percent. Tuesday’s announcement may have been the penultimate one made by Emefiele, whose five-year term ends in June. While he could be reappointed, President Muhammadu Buhari has come under pressure from his political allies to replace the governor, according to people familiar with the matter. It’s unlikely that Tuesday’s easing was due to pressure from the government, according to Robert Omotunde, an analyst at Afrinvest West Africa Ltd.